Having a Macs serial number is important for when you’re ordering AppleCare extended warranties, checking on the status of your current warranty or repairs, or even when just contacting tech support whether it’s Apple or another third party support solution through the phone. 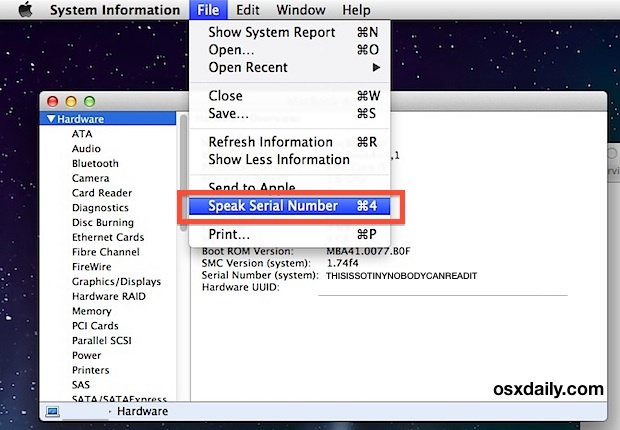 Because you’ll likely need a Macs serial number at some point in time, we will show you two ways to retrieve the hardware serial number from Mac OS X, an easy visual way, and an auditory method where it will be spoken to you as well. 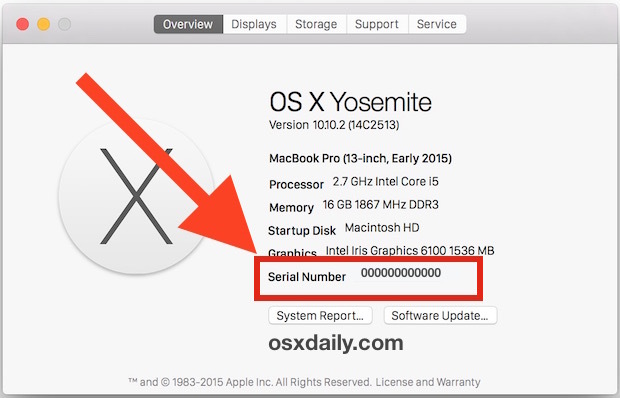 You will find the Macintosh hardware serial number in the same place in all MacOS and Mac OS X versions. Easy enough, right? Yes, but you’ll be more than forgiven if you find that serial number text size to be incredibly small, and frankly, the font is kind of hard to read. 0’s look like O’s, I’s look like 1’s, and nearly everyone has to squint to read the minuscule text. That is exaggerated even more so on higher resolution screens or displays that are pretty small like the MacBook Air, making the text so challenging to read that it’s often read incorrectly which can lead to some frustration as you go back and forth with an Apple rep or yourself trying to guess the proper serial number. A better solution for many is utilize the awesome text to speech features of Mac OS X and have the Mac read the serial number aloud, eliminating any confusion and preventing you from having to squint and guess at the outcome. Conveniently, this is actually built right into the System Information app as an option, though nobody seems to know about it. The serial number will be read very clearly and slowly, making it really easy to understand and transcribe if needed, or provide it to another party over the phone or through online chat support. This is great and and it prevents a lot of confusion that is bound to occur with some of serial numbers out there, so whether using this tip yourself or when performing some remote troubleshooting for someone else, don’t forget this trick, it can prevent plenty of frustration. 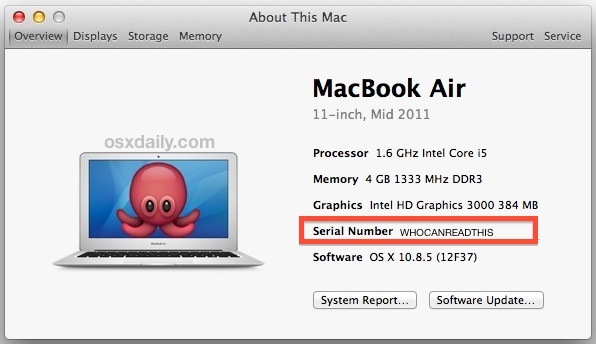 Advanced users can also turn to the command line to retrieve a serial number of a Mac or get it remotely through SSH and remote login, but the vast majority of Mac users will be better off having OS X just read their serial number to them if they’re having difficulties. iPhone 6s Unexpectedly Shuts Down? Apple Might Have a Fix! I have an early/late (not sure) 2008 Macbook and it doesn’t display the serial number in the “about this mac” window. So how would one…?